You will be collected from your Darwin accommodation at 7.30am for your private 13 day 4WD Tour through the Kimberley and Kakadu. We head south along the Stuart highway and into Fog Dam Conservation Reserve. These wetlands have international significance because of their beauty and natural ecosystems. A great variety of fauna can be found here throughout the year as well as a large variety of birdlife. Then we make our way into World Heritage listed Kakadu National park. Kakadu is the largest national park in Australia, has some of the world’s finest rock art and a variety of habitats, including floodplains and savannah woodlands. Once within the park, our first stop are the beautiful Mamukala Wetlands. We can view the birdlife from the observation platform, where the mural depicts the seasonal changes throughout the year. After lunch, we then travel to the very north of the park to Ubirr, where we walk through galleries of ancient aboriginal rock art, which your guide will interpret. Also learn about bushtuckers and bush medicines before reaching the top of the plateau, where you can relax and enjoy the spectacular view over the floodplains and the Arnhemland escarpment. We finish the day with a look around the Bowali visitors information centre. After breakfast we make our way to Nourlangie Rock, an ancient Aboriginal shelter, where we will explore the area and the rock art. Your guide will lead you on an interpretive walk around the site, followed by Nawalandja lookout. The short hike to the lookout is rewarded by a magnificent view over the Arnhemland escarpment. Then we drive to Maguk (Barramundi Gorge and falls). Termite mounds are abundant along the dirt road that takes us to the car park and from there, we take a walk through a paperbark forest to reach the gorge. Once we reach the gorge and waterfall, we can have a refreshing swim in the plungepool. Finally, late this afternoon, board the sunset Yellow Waters wetlands cruise. Yellow Waters billabong is located at the end of Jim Jim Creek, a tributary of the South Alligator River. This is the largest river system in Kakadu and contains extensive wetlands, including river channels, floodplains and backwater swamps. About one third of Australia's bird species are represented in Kakadu National Park, with at least 60 species found in these wetlands. There are also plenty of crocodiles in their natural habitat, and buffalo on the floodplains. This morning, we will make our way south, leaving Kakadu and heading towards Katherine Township. En-route we have a swim and lunch at Leilyn (Edith Falls), en-route. Leilyn is part of Nitmiluk National Park and is well known for it’s picturesque waterfalls and pools, particularly the large pool at the base of the escarpment which is great for a swim. Upon arrival in Katherine, we make our way to Nitmiluk (Katherine) Gorge, home to 13 spectacular gorges, carved out of the rock by torrential summer rains, over millions of years. Here, we cruise for 2 hours viewing the beautiful scenery and discovering the customs of the traditional owners, the Jawoyn people. Today we’ll head west, stopping en-route to view the Victoria River, one of the largest tidal influenced rivers in the Territory with an abundance of saltwater crocodiles. We cross through the border into Western Australia and onto Lake Argyle. This afternoon we take the sunset cruise on the lake, where you will cruise through some of the 90 islands and inlets and take in the magnificent scenery of the Carr Boyd Ranges. Enjoy a glass of sparkling wine and nibblies as the sun sets over the rugged red cliffs and azure blue water. After breakfast, we pop into Kununurra to collect fresh supplies (due to border restrictions) before heading south to the Bungle Bungles. Purnululu National park (the Bungle Bungles) is famous for the ancient range of unusual beehive-shaped domes, gorges and chasms over 350 million years old. The section of road into the park is quite challenging and will give you a real sense of off-road adventure ! There’s time this afternoon for optional helicopter flights (additional cost). We spend today in the Bungle Bungles. Our first stop is Cathedral Gorge, a huge natural amphitheatre, with fantastic acoustics. We take the “Domes trail walk” and then have lunch overlooking the Bungle Bungle massif. This afternoon we take a walk into Echidna Chasm, which is a narrow gorge of conglomerate rock. The walk in is beautiful, passing endemnic livistonia palms. After breakfast, we leave the Bungle Bungles and head north aga in to Emma Gorge, part of the El Questro Wilderness Park, which is a million acres in size. En-route we visit the beautiful Parrys Lagoon, which offers excellent bird watching opportunities in the comfort of the purpose built bird hide or from one of the walkways. We also stop to enjoy the breathtaking views from Telegraph Hill, over the billabong and wetlands. We start today with a relaxing dip at the Zebedee Springs thermal pools, set amongst palm trees. Leaving El Questr o, we head onto the Gibb River Road and we’ll drive through the Pentecost River to a lookout, for fantastic views of the river and the mighty Cockburn Range. We’ll also view an art site of cuples, Wandjana figures and Petroglyphs (rock carvings). This is also where the local Aboriginal people used to shelter and sharpen their spears. We start today with a spectacular 2 hour flight over Mitchell Falls and the Kimberley coast ! Your flight takes you past Mt Hann, Deep Gorge and the Rift, then over the magnificent Prince Regent Nature Reserve. Follow the Prince Regent River, fly over several waterfalls including King Cascades, St George Basin, Mt Trafalgar, Prince Frederick Harbour, the Hunter River, Donkins Hill Falls and the spectacular Mitchell Falls. You may even be lucky enough see crocodiles, dugong and whales. The vast, beautiful, unspoilt coastline of this wilderness area is truly stunning and something you can only see and appreciate from the air. It really will be a highlight of your Kimberley experience. After the flight we make our way south again, stopping on the banks of the Gibb River where we view a rock art site. We re-join the Gibb River road and continue to Mt Elizabeth Station, a working cattle station, established in 1945 by the pioneering Lacey Family. Our first stop this morning is Galvans Gorge, a small picturesque gorge, surrounded by boab trees. It has some interesting rock art and is a great place for a relaxing swim. 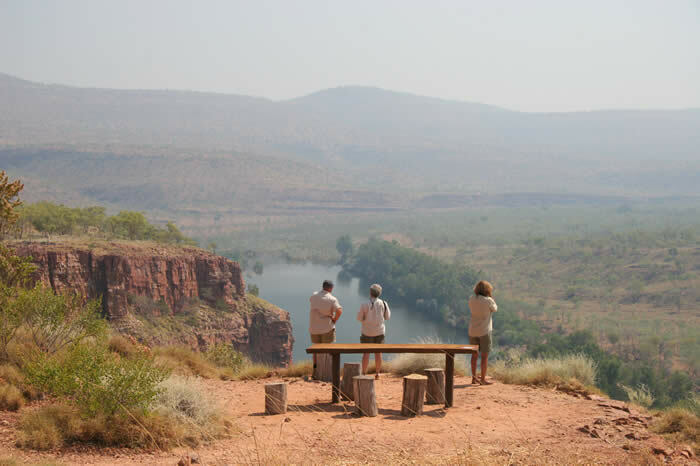 We continue west to Bell Gorge, which is said to be the most picturesque gorge in the Kimberley. We have plenty of time to swim and relax at the waterfall. Then we’ll make our way through the Napier and King Leopold Ranges to our accommodation. Today we drive to Windjana Gorge, part of an ancient Devonian reef system where the Lennard River has cut through the Napier range. We take a walk into Windjana gorge to view the fossilised reef system and freshwater crocodiles can often be seen lazing around on the river banks. We then head off to Tunnel Creek, a 750m long limestone tunnel in the Napier Range, carved into the rock over thousands of years. View stalactites and stalacmites and hear the story of Jandamarra, who used the tunnel as a hideout in the late 1800’s. After breakfast, take the ranger lead boat cruise through Geike Gorge, where flood waters of the Fitzroy River have carved the 30-metre-deep Gorge through the limestone at the junction of the Oscar and Geikie Ranges. After the cruise we travel along the Great Northern Highway towards Broome, with a stop en-route at Willaire. We arrive into Broome mid- afternoon and you will be dropped off at your accommodation. This tour is operated as a private tour only (sole use of tour vehicle and driver guide) and can depart on any day, subject to availability, between May and mid- September inclusive. The itinerary can be fully accommodated and / or amended to suit your requirements, so please contact us for more information or a quote. We would love to do another trip with Sacred Earth Safaris. Darwin to Broome via the Gibb River Road was a wonderful experience. You made it comfortable with great accommodation in the outback. You helped create a wonderful cohesion amongst the 10 of us doing the trip. Your local knowledge and aboriginal experiences gave us an insight others we have spoken to, missed out on, on trips with other tour operators. We will never forget this wonderful trip and your personal attention to detail.